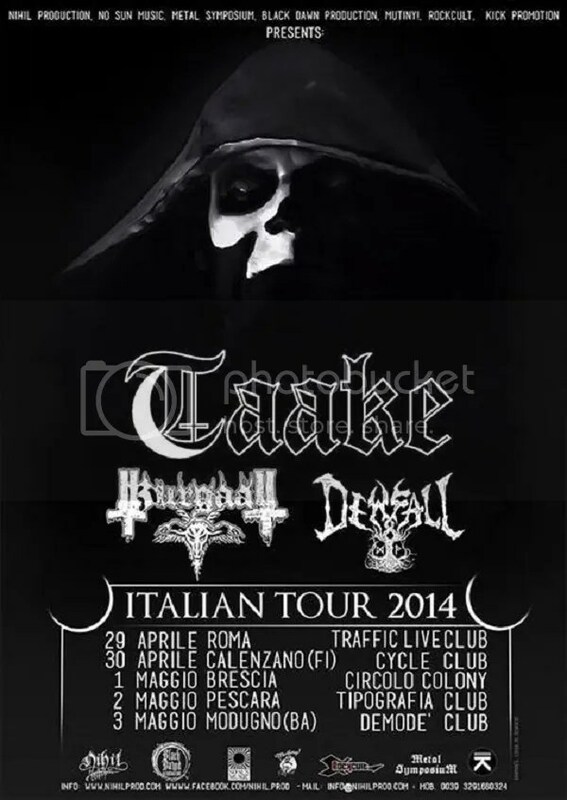 Norwegian Black Metallers TAAKE are set to play a short tour in Italy in April, as well as three additional dates in Europe in the run up to the previously announced European tour with DARK ESSENCE RECORDS label mates – the veteran Dark Metallers AETERNUS and SLEGEST, the new project from former VREID guitarist Ese. Having celebrated TAAKE’s 20th Anniversary last year with the release of “Gravkamre, Kroner og Troner”, a 20-song, 2 CD collection of rarities, the contribution that frontman and founder Hoest has made to the Black Metal scene, both in terms of recording and performing, is immeasurable. Time has not stood still for a band that is not afraid to take risks, but which has always remained true to its roots. Whilst many new Black Metal bands have steadfastly refused to move away from the generic formula that frequently risks sinking the whole genre into a sea of platitudes and unoriginality, TAAKE has shown that Black Metal is still very much alive, fresh, original and thriving.